SEO seems to be getting more complicated every single year. Between tracking competitors, auditing your site for on-page issues and always searching for new link building opportunities, it takes a lot of work. It’s traditionally been a very manually intensive industry that required you to hire VA’s for each of the roles. It’s not only expensive, but it’s also time-consuming to manage a group of employees. For a company looking to grow their organic traffic SEO is a critical part of their marketing strategy. It allows you to put your business in front of potential customers who are searching for solutions to their problems. A complete SEO campaign took a lot of hours of tedious, manual labor. Until now. Introducing, SEOCrawler.co the complete SEO suite. An all-in-one SEO tool to help you boost your rankings, visibility, and conversions. SEOCrawler took everything you hated about SEO and created a solution. It’s designed to be a one-stop-shop for all your SEO needs. No longer will you need a whole shed full of tools, SEOCrawler takes the best features and combines them. In the past, most SEO’s have had to have a separate rank tracking tool. Fortunately, SEOCrawler now includes this as standard in their tool. The rank checker will allow you to monitor a range of keywords across Google, Yahoo Bing and even Yandex. Not only that, but it allows you to specify the geography, allowing you to see how your websites rank in different countries. Now you can track daily changes in your keyword rankings; you can track paid ads, search volumes and changing trends. This tracking gives you all the data that you need to evaluate your campaigns, adjust for the future and maximize your results. Onsite SEO is playing a big a role as ever. If you want to stay ahead of your competitors, then you need to find and fix any on page errors that you have. This tool will show you page speed, duplicate title and meta tags, broken links and other useful data. At the click of a button, you’ll have an on-page report at your fingertips, something you would have had to pay an SEO expert to create in the past. We all know how much impact backlinks can have on our rankings. However, tracking the links that you gain is difficult. With the backlink explorer, you’ll be able to track backlink profiles in real-time, showing you updates and changes. Never again will you miss a gained backlink in a website’s profile. You’ll be able to see a detailed list of the links, which ones broke, all of the metrics for the pages and any links which are gained or lost. Proper research is crucial to beat any competitor. With the competitor’s inspection feature you can track how your website performs against your competitors. It’ll automatically list competitors, perfect for finding SEO rank competition that you didn’t know you had. Not only that but it’ll allow you to analyze your traffic and rankings, showing you differences and potential opportunities. Traffic is only part of the game. Just as important is turning that traffic into conversions. With SEOCrawler.co you can integrate the tool into your Google Analytics account and track your conversions and traffic, creating detailed reports. As a business owner, these reports are excellent for monitoring the effects of on-page changes and for an agency, these reports give your clients the granular detail that they want. As a legitimate business, people are going to talk about you. Hopefully, most of it will be positive, but some of it might not be. Maintaining your brand reputation is critical to sustaining a business. The brand monitor tool is a valuable feature that can track brand mentions across the web and social media platforms. It’ll let you know when you or your company is mentioned, giving you the chance to protect your brand proactively. 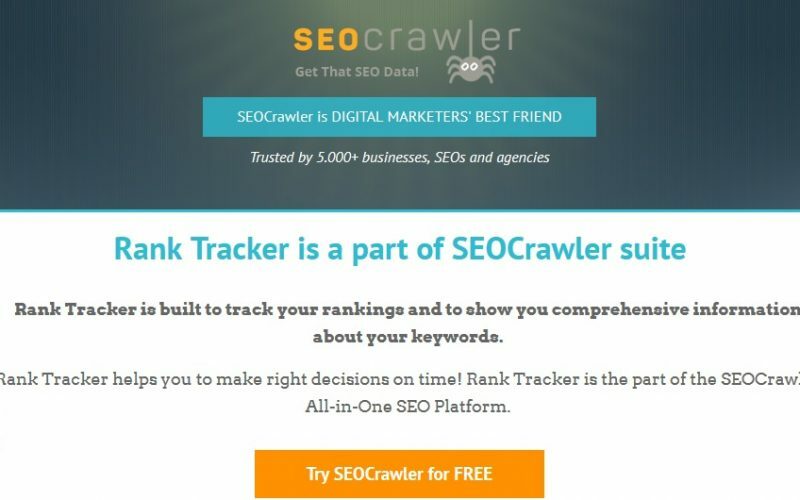 Unlike some of our competitors, SEOCrawler comes with a complete rank tracker that will give you all the data you need to make sure your rankings are stable. Other tools often don’t include a rank tracker, requiring you to purchase another program instead. The ability for you to integrate your SEO tools with your Google Analytics account is still relatively rare. This integration means that you can access all of your data in one place, watching real-time data and creating scheduled weekly or daily reports to review your traffic and conversions data. Most SEO tools fulfill a minimal purpose, offering little else. Built from the ground-up as an SEO tool, SEOCrawler keeps all of your data in one place. Just a single subscription to SEOCrawler will give you a suite of features that you would have needed multiple subscriptions for in the past. All of this is available at a competitive price. There are three pricing levels; minimal, optimal and ultimate. Minimal is available for only $29.95 per month or $269.96 per year. For such a broad range of tools, this is a steal. This price level allows you to monitor five websites over five different search engines, with 250 keywords per account. Perfect for a small agency or a single SMB. The optimal plan is the best option for the majority of customers. Priced at only $69.95 per month or $629.95 per year, it’s cheaper than a lot of competitors. This subscription lets you monitor 2,500 backlinks, ten different competitors, and 2,500 keywords. The optimal plan is for a growing SMB or an agency. Finally, there’s the ultimate package. Perfect for a large company or agency, the ultimate package is an absolute beast. One account lets you handle 50 websites, over ten search engines, with 10,000 keywords tracked and 7,500 backlinks monitored. This package is ultimate; it gives you full access to this powerful suite. If you’re not excited at this point, then there’s no hope for you. This incredible all-in-one SEO tool is available at a bargain price. No longer will you need to hire freelancers to perform repetitive tasks, SEOCrawler handles it for you. From rank tracking through to competitor analysis, SEOCrawler will keep an eye on your entire SEO campaign.